East Village Association | West Town Chicago: What's next for Chicago Bowl site? What's next for Chicago Bowl site? 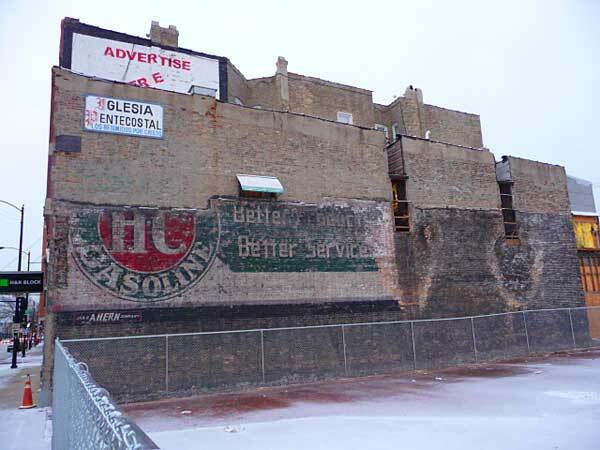 A newly vacant lot reveals an old Sinclair Gasoline billboard at 1854 W. Chicago Ave. The long-shuttered auto warehouse at 1834-50 W. Chicago Ave. is gone, along with plans to locate a performance space there modeled after the Brooklyn Bowl nightclub in New York. A chain-link fence with concrete footings now surrounds the property. Two local alderman are advancing a proposal that would keep the vacant lot from becoming a strip mall. Aldermen Proco Joe Moreno (1st Ward) and Scott Waguespack (32nd) propose extending Chicago Avenue's "pedestrian street" designation from Ashland Avenue west to Damen Avenue. It now stops at Wood Street. A pedestrian street in Chicago zoning parlance requires storefronts close to the sidewalk and bans strip malls, drive-throughs, auto lots, gas stations, car washes and self-storage warehouses. Division Street is a pedestrian street between Milwaukee and Leavitt. Plans for the former AAA Distributing Co. building are unknown, but changes may have been triggered when the property recently cleared probate, East Village Association vice president Neal McKnight says. Razing the structure removes a barrier to potential development, McKnight suggests, and rates a modestly lower property tax bill as a vacant lot. Brooklyn Bowl managing partner Peter Shapiro confirmed to EVA that his development group abandoned plans for a long-term lease of the building. Renovation costs were higher than expected, Shapiro said, and the Chicago Bowl developers grew more concerned that big concerts might overwhelm the area's traffic and parking capacity. The group continues to scout Chicago locations for a music venue, restaurant and bowling alley. Commercial Club Park, 1845 W. Rice St.
For now the vacant lot gives a clear view of Chicago Avenue from the Commercial Club Park playground across the alley. In recent years the Chicago Avenue tract was pursued as a library site or park extension, but the owner did not entertain offers on the property. Budget limits now make such a park acquisition unlikely. 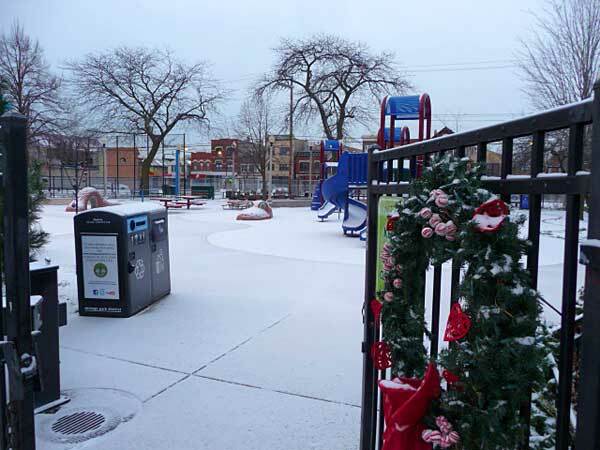 With Eckhart Park and Smith Park each a mile away and Humboldt Park 2 miles, the Park District does not view the area as under-served. Thanks so much for the update! Glad to hear the aldermen are actively working on the pedestrian designation, although it's too bad that Commercial Park expansion isn't a possibility right now -- it seems like such a perfect opportunity.